The spoiler season for Magic: The Gathering's upcoming set Guilds of Ravnica continues this week, and one Izzet split card is already getting a day-zero errata. 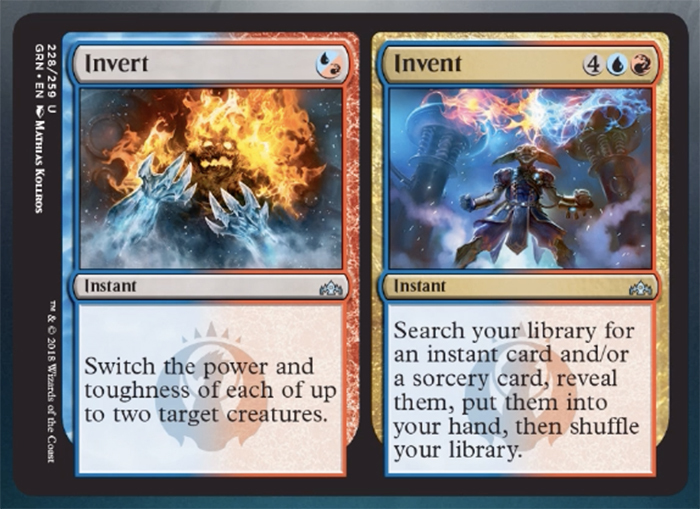 First revealed on MTG's official Twitch channel, the card that got a day-zero errata is called Invert/Invent, and as you can see below, the Invert side is missing "until end of turn" clause at the end, so this might confuse some players who might think that Invert's effect is permanent. Since Invert's effect is only intended to last one turn, Magic Rules Manager Eli Shiffrin announced the day-zero errata on Twitter. How could Wizards of the Coast miss this error? It seems that some fans are not taking the mistake well. Wow. This is literally shows how much #WOTC has been cracking in the recent years. How long does it take to develop, R&D, design, print, package a set? and no one even noticed this until it was too late to redesign? U/C bans and now Day 0 Errata. Magic Senior Design Director Aaron Forsythe took it to Twitter to explain what he thought about the card's effect would be like if it lasted multiple turns. Errata incoming on Invert // Invent. #MTGGRN P/T switching is too bizarre an effect to have linger over multiple turns. It sounds like they intended to design the card that way but they might have changed their minds after the Guilds of Ravnica cards were printed. The following set, Ravnica Allegiance will feature the other five guilds: Azorius (blue-white), Rakdos (black-red), Gruul (red-green), Simic (green-blue), and Orzhov (black-white). Guilds of Ravnica will be released on October 5. Prerelease events will take place on September 29-30.